Ecwid seamlessly integrates with your current GoDaddy website — your website design in preserved and no programming is needed. 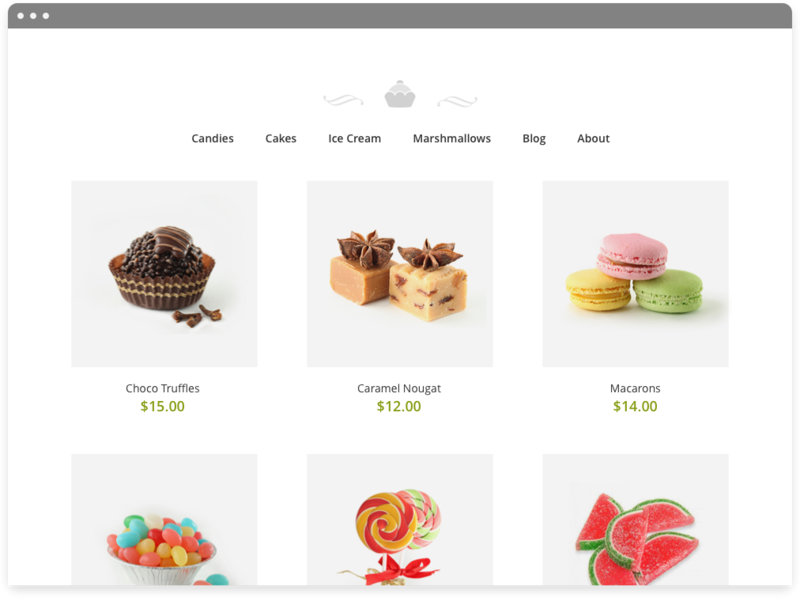 Add your online store to as many sites as you want and manage it from one place. Any changes you make are mirrored instantly across all your sites. Sell on your GoDaddy website, mobile phones, social sites and marketplaces like Google Shopping, eBay and Shopping.com. Ecwid integrates with social networks including Facebook and Tumblr. Your Ecwid store looks perfect on any smartphone and adapts to your customer’s screen. Ecwid offers a clean, straightforward, and easy-to-install GoDaddy shopping cart that is fully loaded with revolutionary features. We ensure that your products will be beautifully and professionally displayed in your storefront image gallery that seamlessly matches your current website design. With Ecwid’s GoDaddy e-commerce solution, your customers will be able to quickly and easily browse your entire catalog, search for products and categories, and make purchases in just minutes. Thanks to Ecwid’s lightning-fast AJAX interface and intuitive navigation, your GoDaddy online store will transform an ordinary shopping experience into a fun, exciting, and memorable experience for your customers. Ecwid’s GoDaddy shopping cart ensures you’ll have no trouble building customer loyalty with special promotions, follow-up email notifications, and full social media integration. You also can extend the reach of your GoDaddy e-commerce solution by developing your community through Ecwid’s free Facebook integration and promote your business via Twitter, Pinterest, and other social networks. Plus, if you have a Facebook page or manage multiple websites, your product inventory will be mirrored across all of your sites. This means you’ll be able to manage everything from a single control panel. You can also download the Ecwid mobile app and manage your GoDaddy online store from any location, on any device, at any time. Do you want to keep your site intact and add a powerful GoDaddy shopping cart? Lucky for you, Ecwid streamlines the process of incorporating a GoDaddy shopping cart into your website. To create your GoDaddy online store, click here. After a few fast and simple steps, you’ll be ready to sell and retain the investment in your current site. Managing shipping and payments is fast and easy with a GoDaddy e-commerce solution by Ecwid. With our shipping configuration wizard, adjustable rates and taxes, and real-time shipping quotes and tracking with most major carriers, you can customize every aspect of getting your products to your customers. The Ecwid GoDaddy online store also allows you to choose from a huge variety of payment options, including all-in-one payment solutions like PayPal, as well as payment gateways and alternative payment methods like Square and Stripe. That way, you can provide your customers with greater flexibility to make quick, secure online purchases. Why Should You Choose Ecwid with GoDaddy? Let’s face it – GoDaddy is great for domains and offering a wide range of online products and even some free hosting, but GoDaddy isn’t an expert in all things e-commerce. At Ecwid, we understand you deserve a best-in-class GoDaddy e-commerce site and always offer a free version of our GoDaddy shopping cart. If you want premium features, we also provide a variety of paid plans to help you further expand your business. Ecwid is committed to excellence and constantly launches new features to help you improve the performance of your GoDaddy online store. Our new features will be automatically streamed into your GoDaddy online store, so there is no need for upgrades on your side. Get started with your free GoDaddy shopping cart today, and you can find out how Ecwid can help you dramatically improve your e-commerce potential. How Do I Get Started with My GoDaddy Online Store? Click here, and you can get started with your GoDaddy online store right away. We offer a seamless process that ensures you can create your GoDaddy online store immediately. How Long Will It Take Me to Start with GoDaddy E-commerce? It should only take a few minutes to begin using GoDaddy e-commerce. This means you won’t have to wait long to start selling. I’m Still Having Problems. Is Extra Support Available? Definitely! The Ecwid team is happy to provide you with the support you need so you can get your GoDaddy online store up and running and keep it that way for years to come. For first-time Ecwid users, we recommend our Ecwid 101 Guide, which serves as an excellent starter resource. Also, you may find answers to your questions in our Knowledge Base, which offers insights into everything from Ecwid basics to assorted technical topics. You can always reach out to us directly for assistance, too. Any time you have a concern or question, please send us a message, and we will respond ASAP.